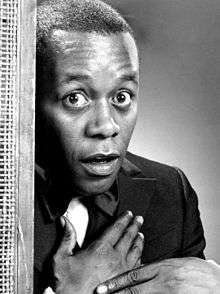 Flip Wilson (December 8, 1933 – November 25, 1998) was an African American comedian and actor. In the early 1970s, Wilson hosted his own weekly variety series, The Flip Wilson Show. The series earned Wilson a Golden Globe and two Emmy Awards. In January 1972, Time magazine featured Wilson's image on its cover and named him "TV's first black superstar". Born Clerow Wilson, Jr. in Jersey City, New Jersey, he was one of ten children born to Cornelia Bullock and Clerow Wilson, Sr. His father worked as a handyman but, because of the Great Depression, was often out of work. When Wilson was seven years old, his mother abandoned the family. His father was unable to care for the children alone and he placed many of them in foster homes. After bouncing from foster homes to reform school, 16-year-old Wilson lied about his age and joined the United States Air Force. His outgoing personality and funny stories made him popular; he was even asked to tour military bases to cheer up other servicemen. Claiming that he was always "flipped out", Wilson's barracks mates gave him the nickname "Flip" which he used as his stage name. Discharged from the Air Force in 1954, Wilson started working as a bellhop in San Francisco's Manor Plaza Hotel. At the Plaza's nightclub, Wilson found extra work playing a drunken patron in between regularly scheduled acts. His inebriated character proved popular and Wilson began performing it in clubs throughout California. At first Wilson would simply ad-lib onstage, but eventually he added written material and his act became more sophisticated. During the 1960s, Wilson became a regular at the Apollo Theater in Harlem and was a favorite guest on The Tonight Show, Laugh-In, and The Ed Sullivan Show. In 1970, Wilson won a Grammy Award for his comedy album The Devil Made Me Buy This Dress. He was also a regular cast member on Rowan & Martin's Laugh-In. Depatie-Freleng Studios featured Wilson in two TV specials, "Clerow Wilson and the Miracle of P.S. 14" and "Clerow Wilson's Great Escape". A routine titled "Columbus," from the album Cowboys and Colored People, brought Wilson to Hollywood industry attention and led to the development of his own television show. In this bit, Wilson retells the story of Christopher Columbus from an anachronistic urbanized viewpoint, in which Columbus convinces the Spanish monarchs to fund his voyage by noting that discovering America means that he can also discover Ray Charles. Hearing this, Queen "Isabel Johnson", whose voice is an early version of Wilson's eventual "Geraldine" character, says that "Chris" can have "all the money you want, honey—You go find Ray Charles!" When Columbus departs from the dock, an inebriated Isabella is there, testifying to one and all that "Chris gonna find Ray Charles!" In 1970 Wilson's variety series, The Flip Wilson Show, debuted on NBC. He performed in comedy sketches and played host to many African-American entertainers, including the Supremes, the Jackson Five, the Temptations, Gladys Knight & the Pips, comedian Redd Foxx, and basketball player Bill Russell. He greeted all his guests with the "Flip Wilson Handshake,": four hand slaps, two elbow bumps finishing with two hip-bumps. George Carlin was one of the show's writers, and Carlin also made frequent appearances on the show, as the two would expand Carlin's news-weather-sports satire. Wilson's characters included Reverend Leroy, materialistic pastor of the "Church of What’s Happening Now", and his most popular character, Geraldine Jones, who frequently referred to her unseen boyfriend, "Killer", and whose lines "The devil made me do it" and "What you see is what you get" became national catchphrases. The Flip Wilson Show aired through 1974, generating high ratings and popularity among viewers and winning strong critical acclaim, with an unprecedented eleven Emmy Award nominations during its run, winning two. Wilson also won a Golden Globe award for Best Actor in a Television Series. After The Flip Wilson Show ended its run, Wilson made guest appearances on numerous TV comedies and variety shows, such as Here's Lucy starring Lucille Ball and The Dean Martin Show among others. Ed Sullivan invited Wilson to perform several times on his popular Sunday night show, and Wilson later singled out Sullivan as providing his biggest career boost. Wilson acted in TV and theatrical movies including Uptown Saturday Night and The Fish that Saved Pittsburgh. In 1976, he appeared as the Fox in a television musical adaptation of Pinocchio, starring Sandy Duncan in the title role and Danny Kaye as Mister Geppetto, with songs by Laugh-In composer Billy Barnes. In 1984, Wilson hosted the remake of People Are Funny. From 1985 to 1986, Wilson played the lead role in the CBS sitcom Charlie & Co. Wilson's last role was a cameo appearance in the sitcom Living Single in November 1993. Wilson was married twice. In 1957 he wed Lavenia Wilson née Dean. They divorced in 1967. In 1979 he married Tuanchai MacKenzie. They divorced in 1984. After winning custody of his children in 1979, Wilson performed less, in order to spend more time with his family. Before becoming ill, he was an active lighter-than-air pilot. On November 25, 1998, Wilson died of liver cancer in Malibu, California, aged 64. Wilson popularized the phrase "The devil made me do it". Also, the phrase, "What you see is what you get", often used by Wilson's Geraldine character, inspired researchers at PARC and elsewhere to create the acronym WYSIWYG. 1 2 3 4 Watkins, Mel (1998-11-27). "Flip Wilson, Outrageous Comic and TV Host, Dies at 64". The New York Times. Retrieved 10 June 2010. ↑ "Flip Wilson (January 31, 1972)". time.com. Retrieved 10 June 2010. 1 2 Tafoya, Eddie M. (2011). Icons of African American Comedy. ABC-CLIO. p. 89. ISBN 0-313-38085-6. ↑ Pierce, Ponchitta (April 1968). "All Flip Over Flip". Ebony. Johnson Publishing Company. 23 (6): 65. ISSN 0012-9011. ↑ Lohr, Steve (2001). Go To. Basic Books. p. 128. ISBN 0-465-04226-0. Wikimedia Commons has media related to Flip Wilson.